Watch for the magnificent conjunction of Mars and Jupiter in the predawn sky on January 7, 2018. Then get ready for a great year of Mars- and Jupiter-watching in 2018. All week, before dawn, bright Jupiter has been moving up toward fainter Mars in the predawn sky. Before dawn on Sunday – January 7, 2018 – Mars and Jupiter are in conjunction, with the red planet Mars appearing about 0.25o south of the giant planet Jupiter. That’s about the equivalent of one-half of the moon’s diameter. This is the first conjunction of Mars and Jupiter since October 15, 2017; and the next one won’t be until March 20, 2020. You’ll find the planets high in the sunrise half of your sky before dawn. Jupiter beams as the brightest starlike object in the January 2018 morning sky, shining some 20 times more brilliantly than Mars. The fainter, red “star” near Jupiter will be Mars. Binoculars will enhance the view – especially the contrasting colors of the two planets – so grab them before heading out the door. Mars and Jupiter will be easy to spot on January 7. 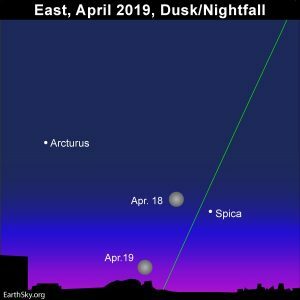 It’ll be more of a challenge to catch Mercury as the predawn darkness gives way to dawn. Look for the Mercury near your sunrise horizon. 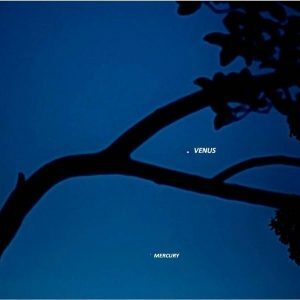 Click here for recommended almanacs; they can help you find out Mercury’s rising time into your sky. 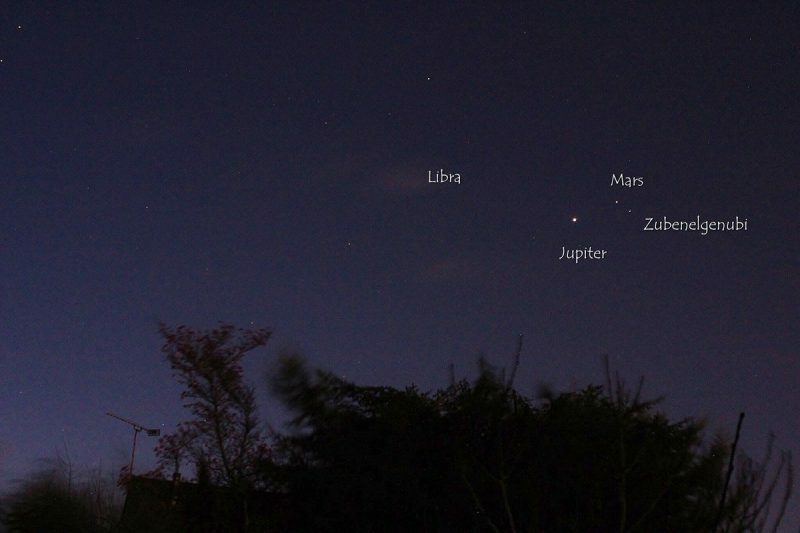 Steve Pond (@aboveeg on Twitter) sent this awesome shot of the planets before dawn on the morning of January 3, 2018. In the months ahead, Mars will seem to linger in the sky before dawn, while Jupiter rises earlier, and earlier, and thereby shifts away from it. Jupiter’s opposition, when Earth will pass between the sun and Jupiter – placing Jupiter in our eastern sky at sunset – will come in May. Mars, too, will suddenly seem to start brightening and moving toward the evening sky. 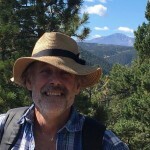 Its opposition – in late July 2018 – will be one of the best for many years. If you’re outside very early on January 7 – the morning of the Mars/Jupiter conjunction, you might not see Mercury. It might not have risen yet. But you can see the star Zubenelgenubi near the planets, and bright reddish Antares below them. 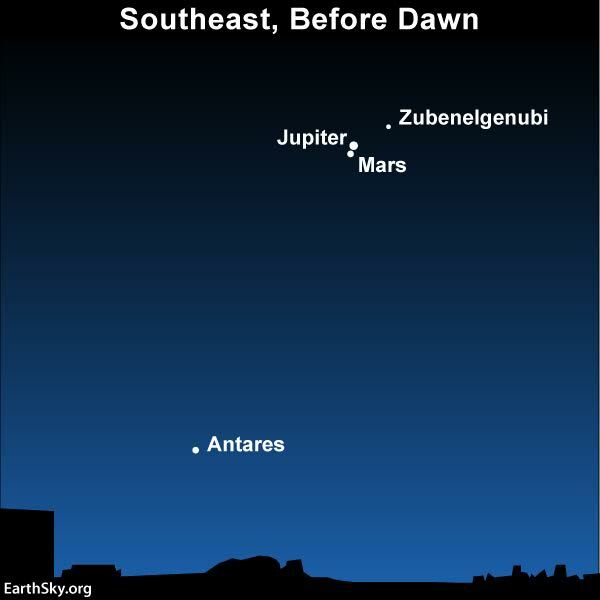 As seen on the sky’s dome, both Mars and Jupiter will be moving away from the star Zubenelgenubi and toward the star Antares. But Mars travels through the constellations of the zodiac at a much faster clip than does slow-plodding Jupiter. So Mars will pass 5o north of Antares on February 11, 2018, whereas Jupiter won’t pass to the north of Antares until December of 2019. In fact, you can use dazzling Jupiter as your guide “star” to Zubenelgenubi, the alpha star in the constellation Libra the Scales, for the most of 2018. When you contrast the brightness of Mars and Jupiter in January 2018, you might find it hard to believe that Mars will actually be the brighter of these two luminaries in six more months, around the time of its July 2018 opposition. By the end of the first week of July 2018, Mars will finally catch up with Jupiter in brightness. Then in late July 2018, when Mars comes closest to Earth for the year, Mars will shine most brilliantly in Earth’s sky since 2003. Mars will outshine Jupiter by some 1.8 times in late July/early August 2018. For a period of about two months, Mars will supplant Jupiter as the fourth brightest celestial body, after the sun, moon and Venus. Mars’ reign as the fourth-brightest celestial body (or third brightest in the nighttime sky, after the moon and Venus) will last from about July 7 to September 7. Mars has a much greater range of brightness in our sky than Jupiter does. That’s because Mars is about 6.5 times more distant from Earth at its farthest than at its closest. In contrast, Jupiter is only about 1.5 times more distant at its farthest than at it closest. For instance, when Jupiter comes closest to Earth for the year at its opposition on May 10, 2018, it’ll only be about 30% closer to Earth, and approximately 1.9 times brighter, than on January 7, 2018. Yet, when Mars comes closest to Earth for the year in late July 2018, it’ll be about 85% closer to Earth, and nearly 50 times brighter, than it is on January 7, 2018. On the mornings of January 10-12, 2018, the waning crescent moon will sweep past the planets Jupiter and Mars. 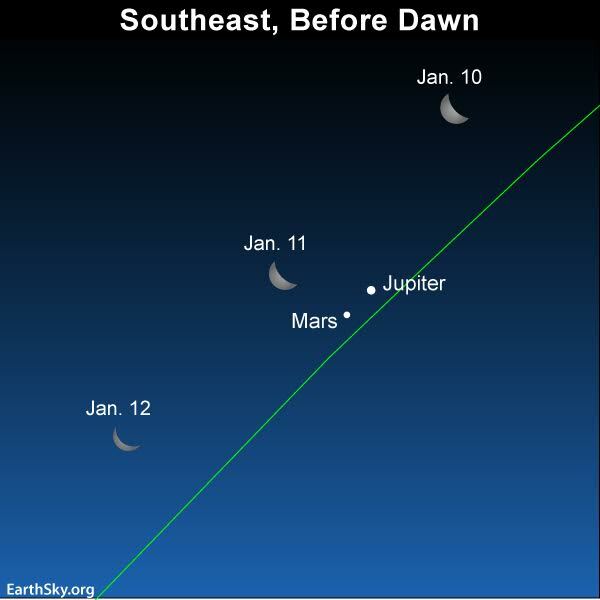 Bottom line: Watch for the great conjunction of Mars and Jupiter in the predawn sky on January 7, 2018. Then get ready for a great year of Mars- and Jupiter-watching in 2018.